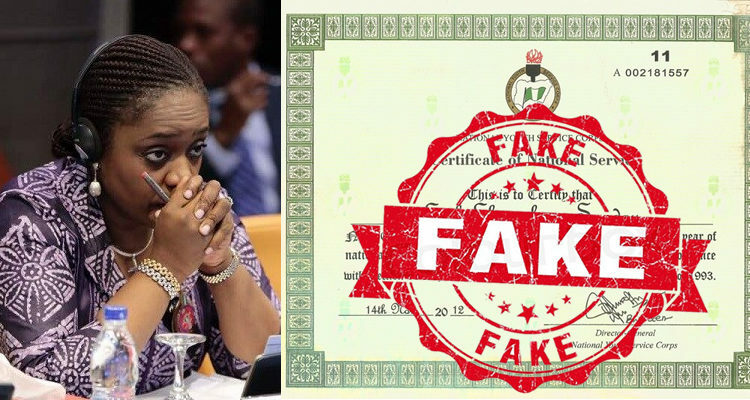 While the Nigerian government has continued to be silent over the certificate forgery scandal of its finance minister, Kemi Adeosun, it has successfully prosecuted a civil servant for falsifying his ICAN certificate. James Lebi-Ayodele, who worked at the Office of the Auditor General of the Federation, was convicted by an FCT High Court in Jabi in July and sentenced to two years in prison without an option of fine for forging the Institute of Chartered Accountant of Nigeria certificate. According to a report in Vanguard, the judge, Yusuf Halilu, said the convict would have risen to the position of the AuditorGeneral of the Federation with a forged certificate in the future if the forgery had not been detected. The conviction came days after PREMIUM TIMES exposed how Ms Adeosun skipped the mandatory one year National Youth Service Corps scheme and forged a certificate that fraudulently indicated she was exempted from participating. The revelation trigerred widespread outrage from Nigerians, with the Human and Environmental Development Agenda, a nongovernmental organisation,petitioning the police inspector general demanding an investigation into the claims against the minister. Last month, another nongovernmental organisation, the Social Economic Rights and Accountability Project (SERAP), sued the NYSC for its failure to disclose details of the certificate paraded by the minister. So far, the corps’ only comment on the scandal was a short statement on July 9 saying it would investigate the claims. But the Independent Corrupt Practices and Other Related Offences Commission (ICPC) acted swiftly in the case of Mr Lebi-Ayodele, arraigning him on three counts of forgery, being in possession of a forgeddocument, and giving false information. In sentencing the convict, the judge said it would serve as lesson to those who procure fake certificates and those who intend to engage in such act in the future. “The convict knew full well that he never had ICAN certificate,” the judge said. “He forged the certificate and eventually got elevated from executive officer to a senior auditor in a country where securing government employment is a huge challenge, and with the army of graduateswho have truly earned better certificate but (have) remained unemployed. It is now over 60 days since Minister Adeosun was exposed for forgery but authorities are yet to open investigation into her case. Many Nigerians believe Ms Adeosun’s offences might be higher than Mr Lebi-Ayodele’s, having used her forged NYSC certificate to clinch high level jobs, including those of commissioner in Ogun State, and minister in the federal cabinet. 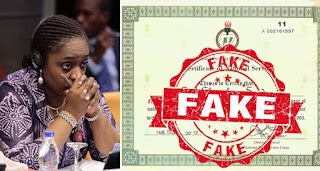 There are suggestions that she could be prosecuted for perjury as well for presenting the fake certificate to the Ogun House of Assembly and the Senate as genuine. Lying on oath is a criminal offence in Nigeria, which attracts jail terms. For instance, a year ago, the Federal High Court in Lagos jailed one Ibikunle Olusakin, to seven years imprisonment for presenting forged documents to the court when he acted as surety for a suspect. According to a report by The Nation, Mr. Olusakin stood as surety for Emmanuel Nweke, charged with unlawful importation and possession of prohibited firearms. After Mr. Nweke jumped bail, the police found that he lied on oath and that all thedocuments he presented were fake. The forged document presented ny the surety included a University of Lagos (UNILAG) degree certificate dated March 3,1982, National Youth Service Corps (NYSC) certificate with no. A815994, dated September 4, 1983 and a Lagos State Government Confirmation of Appointment letter dated October 16, 1989. He also presented a Lagos State Government offer of appointment as Primary Class Teacher dated August 12, 1985; Lagos State Government Educational District II letter dated April 4, 2011 and Lagos State Government Staff Identify Card. Justice Mohammed Idris promptly sentenced him to seven, three and seven years respectively in count one, two and three. The sentence is running concurrently.